← Hershey Bar Pie – What a treat! We went blueberry picking over the weekend and came home with a bumper crop as well as 2 blueberry bushes to call our own. My youngest son loves blueberries but has never had a blueberry pie. So he requested a blueberry pie. 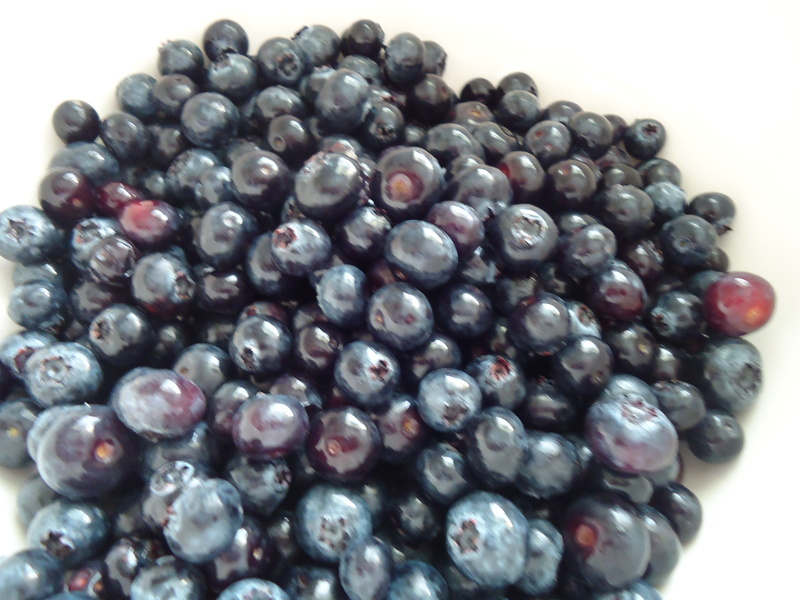 Here are the blueberries waiting to become a pie. Blueberries waiting to become a pie! Blueberries freeze very well. To freeze them, place a single layer of blueberries on a rimmed baking sheet and place in the freezer. Once they are frozen, in about an hour, transfer to a zippered freezer bag, press all the air out and return to freezer. To use frozen blueberries, do not thaw. They will become a bit mushy. They are perfectly fine to use in baked goods and, by not thawing them, they should not bleed into your muffin, bread or coffee cake batter. Use a few frozen blueberries in place of some ice in lemonade. They look pretty floating in a glass of yellow sugar goodness. Frozen blueberries are a great addition to just about smoothie. Make a three berry smoothie with blueberries, strawberries and raspberries. YUM! Now for the pie recipe. I found this recipe in a cookbook called Ready, Set, Dough! by Melanie Barnard. She calls her recipe Night Sky Blueberry Pie because she uses star shapes to cut out the crust. I use whatever cutter I have handy! This instantly became my husband’s favorite blueberry pie. It’s now his blueberry pie. Preheat oven to 425 degrees F. Measure out and reserve 2 teaspoons of the sugar. In a large mixing bowl, gently stir together the blueberries, remaining sugar, flour, lemon juice and zest and cinnamon. Try not to crush berries. Keeping one crust refrigerated, gently place one crust into a 9-inch pie plate. Heap the blueberry mixture into the crust. Place other pie crust on a lightly floured counter. Use lightly floured small cookie cutters in any shape you like to cut out 3 to 4 shapes from the crust, leaving at least a 2 inch border uncut. Reserve the cut outs and place the top crust over the blueberry mixture. Use your fingers to pinch the crusts together and flute or crimp as desired. Brush the top crust with the milk and sprinkle with the reserved sugar. Place cut outs on top and brush with milk. Place pie plate on foil covered rimmed baking sheet to catch any drips. 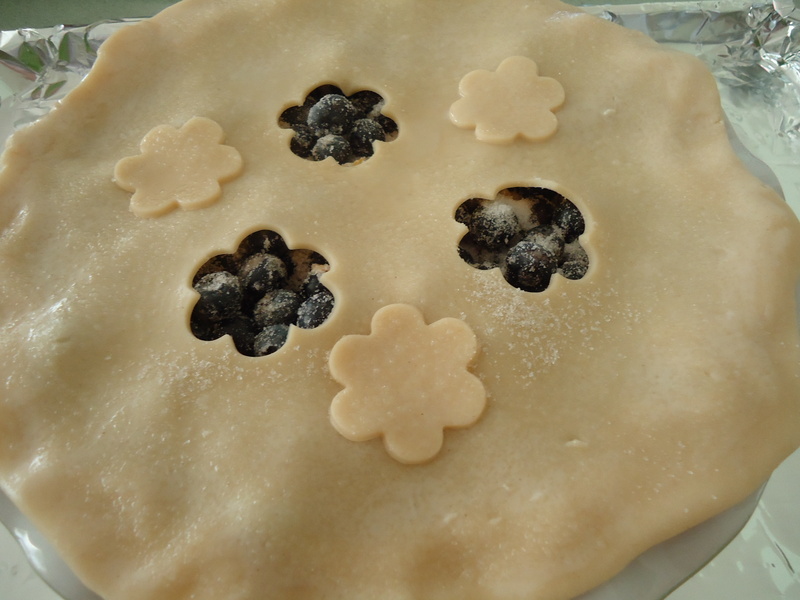 Cover pie edges with pie crust shield or ring of aluminum foil. Bake the pie for 30 minutes, then reduce the oven temperature to 400 degrees F. Bake for 15 minutes. Reduce the temperature to 375 degrees F. Continue baking until the juices are bubbling and the crust is rich golden brown, about 15 minutes longer. Cool to warm or cool completely and serve with whipped cream or vanilla ice cream. Enjoy! 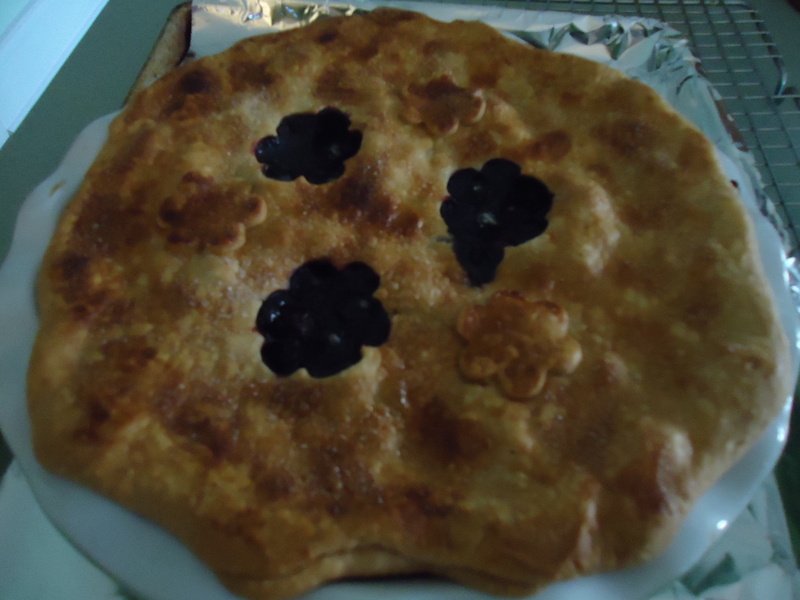 Right from the oven fresh blueberry pie! This entry was posted in 4th of July, Holidays, Pies. Bookmark the permalink.